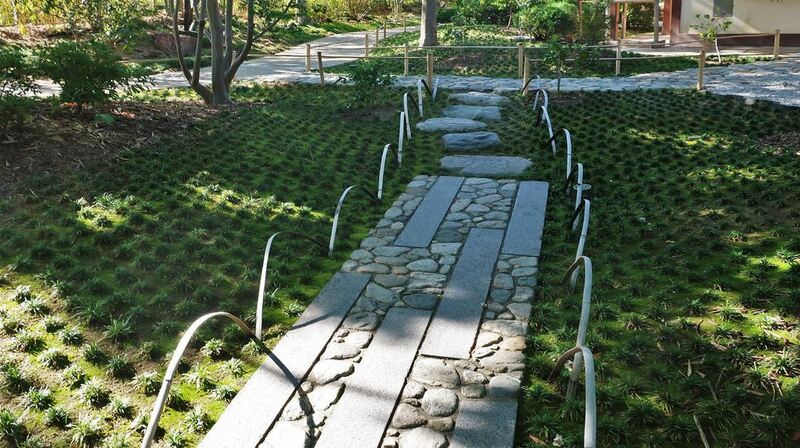 You are here: Home / Exterior Design / What is Mondo Grass? Mondo grass is can an attractive clump of stemless, dark green, grass-like leaves which are sometimes described as miniature bushes. Mondo grass is the perfect groundcover or low rising border because in the summer after a care-free growing cycle, tiny spikes of lilac flowers appear to add even more beauty to the textured, evergreen grass. As this is such a beautiful plant, there are many great garden scenario’s you can utilize it in, especially since there are also many types and colors of the plant which blossom a different kind of flowers and berries. And of course, after this we’re going to talk about just how you can grow your own Mondo Grass. Probably the most popular kind of Mondo Grass out of the 3, Dwarf Mondo Grass is only half the size of the others which makes it a great ground cover because of the dense, dark green, grass-like clumps it grows into. Excellent for an additionalplant that needs to help compliment a rocky garden display. Most commonly used for decoration rather than as a complete alternative to your typical garden grass, due to that fact that it does not make for a great surface when a lot of walking has been made onto it as it does not hold its orignal shape well. However if you’re someone who likes to attend to their to garden for a more decorative approach than someone who uses it on the daily basis, Dwarf Mondo grass, also known as ‘ophiopogon japonicus gyoku ryu‘ makes for the perfect alternative to typical garden grass due to the little care it requires to grow and when it does grow the process it is so slow it will take quite some time till it needs attending to – which may never happen since its full growth is pretty tame anyway so its more about preference. 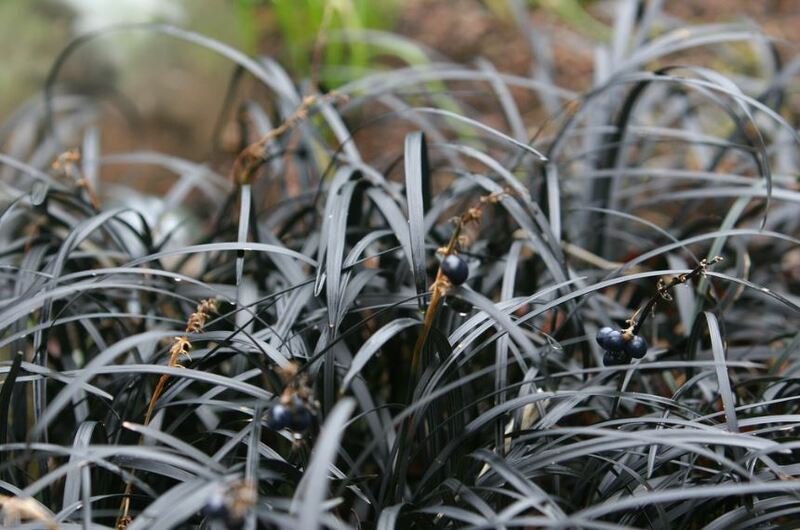 Much like of the traditional Mondo grass, the Black Mondo Grass features a similar use that it fulfils, used for decorative use rather than for a replacement of the common garden grass. The purple-black grass-like foliage is thick and dense just like its greener cousin, ideally used for covering borders are bare garden scenario’s. Nicknamed ophiopogon planiscapus black dragon, when the plant has fully blossomed in the summer, the Black Mondo Grass just likethe previous Mondo Grass produces spikey lavenders which are a lot darker than usual After the summer, once all of the flowers have died and dropped off, in fall it produces black mondo grass berries, poisonous to most typical garden wildlife, and we probably shouldn’t eat them either. The young leaves would start off with a greenish hue which with time slowly turn into the black/purple color black dragon grass has. The flowers which eventually grow can be pink, pale or white and are followed by fleshy blackberries that can remain on the plant up until winter and then, the process repeats itself in the new year constantly. Ophiopogan Japonicus is essential Dwarf Mondo Grass except its not a dwarf plant a rather grows to a more fuller, longer length you’d expect from a grass plant. Again just like we’ve discovered from the other Mondo Grass-types, this particular one should be used for decorative purposes to help bring out the beauty in borders and garden paving. With an average height of 6 to 10 inches, the great thing about this species is that it can grow around about 15 inches per plant which allows this area to remain weed free which drastically reduces the time and effort needed to maintain this particular area of the yard. On top of this, Ophiopogon Japonicus can be grown in a shaded area, so you will not be constrained by the way the sun may hit your garden depending on the time of day, which makes it a great species of plant for any decorative situation. How to Grow Mondo Grass? Now we’ve spoken about the specific species of plant, its time to discuss how you can add this wonderful decorative grass to your garden area of choosing, regardless if you’re looking how to grow black mondo grass specifically or you’re choosing one of the other great alternatives’s, the advice below will help to steer you in the right direction when it comes to adding this beautiful plant to your front or back yard. You’ll be happy to know, even if you’re not a veteran gardener and you’re just looking for a definitive way to decorate your outdoor space so that you can leave it to prosper for many years with little to no maintenance, then Mondo Grass is specious of plant you’ve been looking for. All you have to do is purchase seeds from your local store, or to make things even easier grab some pre-grown plants instead to speed up the process if you’re wanting to of a decorative garden today. Your biggest task is ensuring weeds don’t overtake this area before the Mondo Grass gets to fully grow, so general garden maintenance will help to combat this common issue; I’d refrain from using chemical based detergents on any weeds that grow since it could negatively impact the growth of your Mondo Grass so taking out the weeds by hand will be your best solution. Best Time To Plant: We recommend you plant your Mondo Grass, whatever the species, in the early spring following the last winter. However, you can plant later in this season if you must but ensure you’re giving your plants enough time to establish itself in the plot before frost sets in. Which Soil To Use: Simple, planting it in a slightly acidic soil is best for Mondo Grass and will also allow it to achieve the best results for your garden. Plant Depth: Now, this only applies to those of you who have or are looking to buy pre-planted Mondo Grass, ensure that you replicate its growing depth like it was in its original planter so you do not mess with the growing process or you will affect how well or if the Mondo Grass will grow. Plant Spacing: For multiple plants, which we recommend using in most cases if you’re not mixing in other plant species is by planting Mondo Grass 3-4 inches apart which will give you full coverage, for a more cleaner look we recommend 6-8 inches in most cases. Feeding: Lastly, once you’ve gotten everything in place, its time to help your plants growth with some light diluted organic fertilizer which should be used every spring for the first couple of years, no need to overdo it. Another thing to consider is the spreading of your plant since you’ll need to know how well you should space them apart so that they can properly spread and you can utilize their growth to its full potential. Now we’ve discussed this previously in the list above but we’d like to address these questions separately in a little more depth. 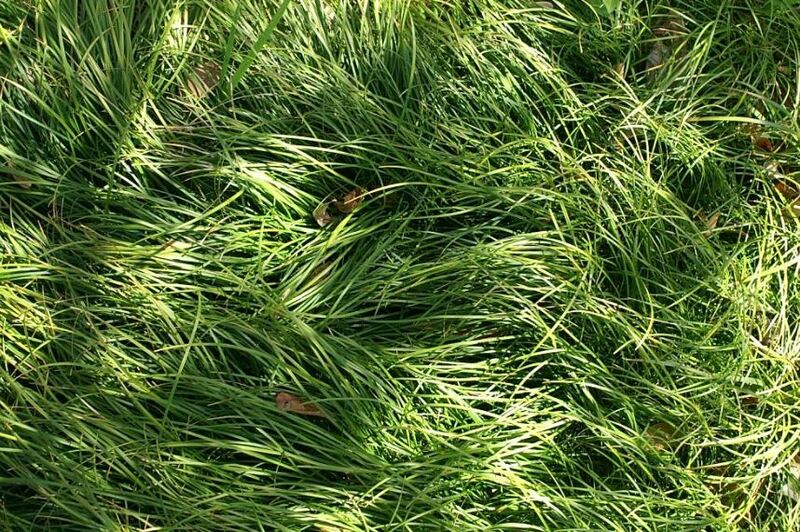 Mondo Grass, with the non-inclusion of the Dwarf specious, it usually takes around a year or two to fully mature to its mature spread of 1 foot wide. 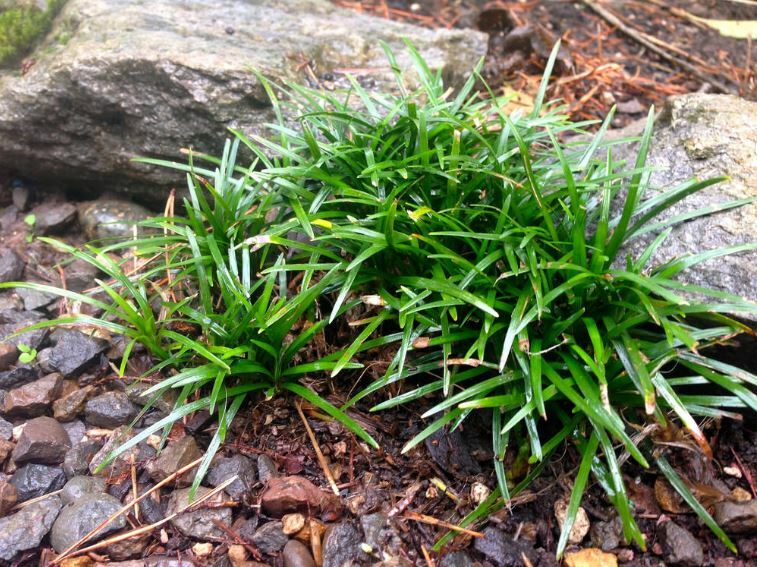 In the case of Dwarf Mondo Grass, it takes it around about 2 to 3 years of a healthy life span to reach its maximum spread potential of 3 to 4 inches. So in short, yes it does spread with proper care and good growing conditions, which affects how wide your grass is going to spread, as a positive this can be used to your advantage if you’re looking to grow it in a specific space in your garden so using things like borders to ‘trap’ the plant in a space will help you to achieve this effect.